What Day Of The Week Is November 28? 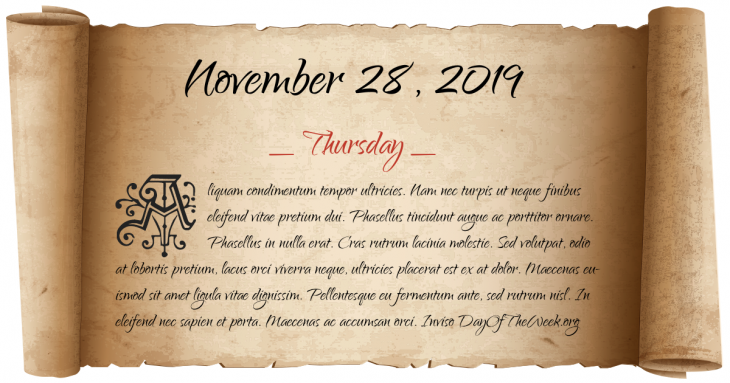 November 28, 2019 is the 332nd day of the year 2019 in the Gregorian calendar. There are 33 days remaining until the end of the year. The day of the week is Thursday. Here’s the November calendar. You can also browse the full year monthly calendar. On the last day of the Council of Clermont, Pope Urban II appoints Bishop Adhemar of Le Puy and Count Raymond IV of Toulouse to lead the First Crusade to the Holy Land. At least 3000 men of the Scottish Royal Army led by Tam Dalyell of the Binns defeat about 900 Covenanter rebels in the Battle of Rullion Green. Ka Lā Hui: Hawaiian Independence Day – The Kingdom of Hawaii is officially recognized by the United Kingdom and France as an independent nation. Bulgarian victory in the Serbo-Bulgarian War preserves the Unification of Bulgaria. In Haverhill, Massachusetts, scrap-metal dealer Louis B. Mayer opens his first movie theater. Albania declares its independence from the Ottoman Empire. Vietnam War: National Security Council members agree to recommend that U.S. President Lyndon B. Johnson adopt a plan for a two-stage escalation of bombing in North Vietnam. Fred Quilt, a leader of the Tsilhqot'in First Nation is severely beaten by Royal Canadian Mounted Police officers; he dies two days later. East Timor declares its independence from Portugal. Iran–Iraq War: Operation Morvarid – Over 70% of Iraqi Navy was destroyed by Iranian Navy in The Persian Gulf. The Iranian Navy’s Day. Who were born on November 28?